‘As a people, we are now called Australians because a vast and lonely land has touched us with her differences’ – George Ivan Smith, 1953. At WOMADelaide 2019, artists who call Australia home echo the sentiments of Smith, a former United Nations director. Celebrating differences can be found in projects by Indigenous Australians and Australia-based artists from Mongolia, Colombia, Chile, Venezuela, Burkina Faso and Papua New Guinea. All are presenting challenging, albeit exhorting, performances that take on Anglo-dominance in the Australian music industry. WOMADelaide, World Music and Dance Festival, always takes us on a journey. But this year, that journey points out back to the great sunburned terra we call Australia. In 2014, Sydney-based Mongolian man, Bukhu, was awarded the Distinguished Talent Visa for his contribution and commitment to Australian music and culture. Through his music, Bukhu provides a glimpse into the world of a humble, gentle, intelligent soul. It is no wonder he has gained such favour with his audience and students. "I love sharing my culture, especially in such a young country like Australia. I love helping people to understand new cultures… people don’t know that much about Mongolia," says Bukhu. "Music makes us stop and learn about an artist’s culture [and] in Australia, we have such a wonderful opportunity for this." Bukhu attended the prestigious Music and Dance Conservatory of Ulaanbaatar in Mongolia. He is a virtuoso of the morin khuur, or horsehead fiddle, and the ancient tradition of Khuumii throat singing. "Khuumii is slightly different from Tuvan throat singing," says Bukhu. "With Khuumii, I can create overtone melodies." To hear Khuumii in the flesh is enthralling – the high-pitched overtones produce a sound akin to whistling which resonates over a profound distance. The morin khuur can be bittersweet; often smooth at other times dynamic, gruff and almost Celtic-sounding. Bukhu has taken his incredible vocal skill and adapted it to Australian folk music as well – a trilling version of 'Waltzing Matilda' was the result. Joining Bukhu are improvisational vocalist Lizzie O’Keefe and multi-instrumentalist Linsey Pollak. Since 2015, O’Keefe and Pollak have collaborated under the name Dangerous Song, a project unabashed in its objectives to awaken the Australian psyche to the extinction crisis, and to draw attention to other marginalised groups and voices. "This project… is getting us to look at the way we live our lives," says Pollak. "Here in Australia, we have some wonderful diversity that can sometimes be hidden away and marginalised." Pollak layers samples of endangered animal calls on a digital wind instrument he nicknames 'The Lyrebird', overtop O’Keefe’s angelic, four-octave range vocal improvisations. Dangerous Song and Bukhu are an enigmatic trio, emboldened by their improvisational practice sessions which have been symbolic to the project’s aspirations to connect hearts and minds with the impact of anthropogenic degradation. After a brief sabbatical on her home turf in Papua New Guinea, 20-year-old Melbourne-based rapper Kaiit returns to bless her audience with her honeyed, soulful vocals reminiscent of big names like Lauryn Hill and Amy Winehouse. But she firmly prides herself on her Papua New Guinean heritage. The release of her album Live from Her Room in September 2018 gave us standout tracks, such as ‘Natural Woman’ and ‘OG Love Kush pt.2’, pairing eclectic lyrics with smooth melodies. Kaiit is unique, both in sound and style. She is a welcomed voice to the world of neo-soul and is an altogether distinct addition to an emerging multicultural rap scene in Australia. To add to this colourful array is the Amaru Tribe, who proffer a wholly new genre of music they call Oceanic Cumbia. "It is a kind of courtship of the music of Oceania," says Amaru Tribe lead singer, rapper and visual artist, Katherine Gailer. 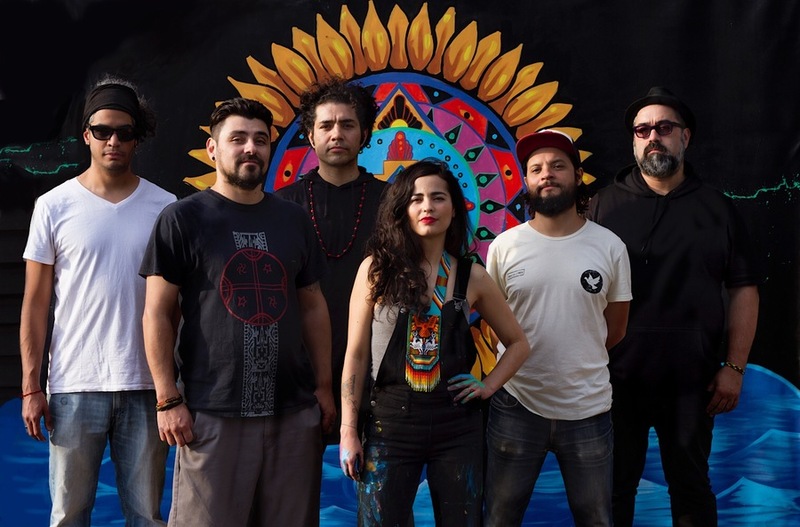 The group have been based in Melbourne for four years – marrying sounds from their home nations of Colombia, Chile, Argentina and Venezuela. "To us, Oceanic Cumbia music means honouring our past, while exploring and recreating our identity here in Oceania," says Gailer. "Australia is an amazing country, where new identities are constantly flourishing out of the interaction of so many different cultures. It seems that the space for diversity is slowly reaching different industries – including the music industry… We are deeply connected to our South American roots and we are building channels through which these two sides of the world can enrich each other," she says. Finally, and perhaps most importantly, Broome-based theatrical dance company Marrugeku come to WOMADelaide with their latest project Le Dernier Appel. Since 1995, Marrugeku have challenged audiences with provocative choreography and storytelling. Directed by Associate Artist Serge Aimé Coulibaly, Le Dernier Appel marries contemporary dance and traditional Australian, New Caledonian Indigenous and Burkinabe influences. It is a final cry against dominant colonial perspectives on major issues. "In Australia, we have this ingrained preconception of each other that clouds what you’re able to open your mind to, and if you put that to the side and let a performance speak to you, it has the potential to make you see something very differently," says co-artistic director and co-choreographer Dalisa Pigram. Le Dernier Appel is timely, as it follows Australia’s treaty talks with First Nations’ Elders and the November 2018 New Caledonian referendum for independence. "These were certainly pressure points that sparked our work on the project," says Pigram, "but we acknowledge it’s not so easy to say which way a country should go." Co-artistic director and dramaturg Rachael Swain likewise cautions against viewing the piece solely as a protest. Instead, Swain says, "we wanted to explore how these drawn out debates manifest in the lives of people in First Nations’ communities who continue to live with the deterioration of their communities and [a] loss of agency." By comparing Australia’s history with the indigenous people of other Asia-Pacific countries – the Kanak in New Caledonia, for example – Le Dernier Appel spotlights the complexity in such discussions. "There is a way that [non-Indigenous] people avoid looking at particular issues, as if they’re only issues for Indigenous Australia, but we really want to reposition issues that First Nations’ communities are dealing with… [and] create a space that engages the public in their own responsibility for the current situation in Australia," says Swain. Expect tension, frustration and powerful rhythmic dramaturgy, punctuated with intercultural influences and an indomitable hope for healing. Amaru Tribe; Dangerous Song &amp; Bukhu, WOMADelaide – Botanic Park, 9 Mar. Marrugeku, 10-11 Mar.